April is Colorado's second snowiest month, so making this snowman table topper / tree skirt just makes sense! This is the perfect project to learn how easy fusible web makes a project like this! 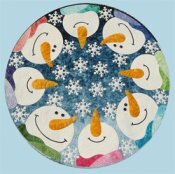 The large snowman applique pieces are fast to cut, and you'll use our Accuquilt die cutter and die to cut the snowflakes in class. You'll learn basic applique stitching or you can free-motion quilt your pieces down instead. for Snowman Table Topper / Tree Skirt. Students should have some basic quilting / sewing experience.